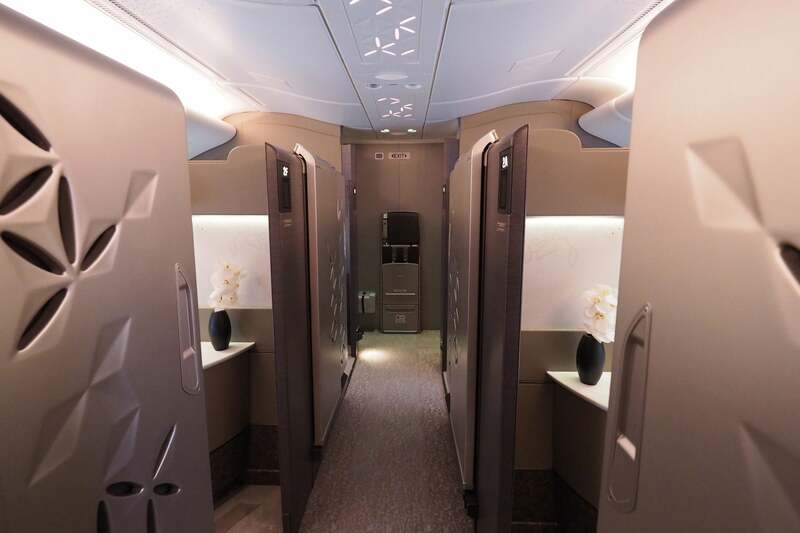 On December 1, Emirates launched its incredible new first-class suite on the 777-300ER, and this week Singapore Airlines followed with a gigantic launch of its own. I had a chance to check out the airline’s A380 on a 12-hour delivery flight from Toulouse, France (TLS) to Changi Airport (SIN), and TPG reader Kelly D. managed to snag a suite on one of the inaugural flights, giving us a chance to experience the product both on an empty plane and one filled with passengers on the first revenue flight from Sydney (SYD). Warning: If you watch this tour of Singapore Airlines' new first-class suite you'll probably never be willing to fly economy again. In short, this is one of the best first-class products to date. 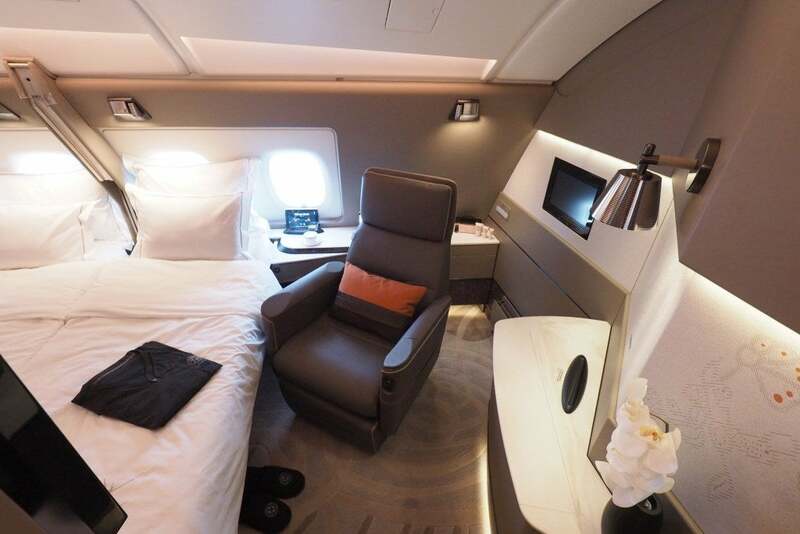 Although it’s not perfect, the design is spectacular, and a big step up from Singapore’s already excellent A380 suite. The suite really shines when you’re traveling with a companion, though, since you can lower the center wall and combine two suites into one — you even get a legitimate double bed, without an awkward partition separating you from your partner. I really think Singapore has a winner on its hands, but five features stand out in particular, which I’ll run through below. Back when Lufthansa was still offering a first-class cabin on the 747-400, the airline’s upper deck contained just eight seats, each with its own separate bed. I only had a chance to experience this product once, but it remains one of my all-time favorites — Lufthansa really invested in a top-quality bed, and since the seat was entirely separate, you got a “real” mattress. While Lufthansa has since eliminated first class on that plane, Etihad offers a similar arrangement on its own A380s, which I also had an opportunity to try, back in 2015. Having a separate bed offers ultimate flexibility, since you can move back and forth without converting your seat to a bed, or vice-versa, so I was thrilled to see that Singapore adopted this concept with its latest suite. In his review this week, Kelly pointed out that the bed itself is a bit on the firm side, even after adding the mattress pad, but it’s a pretty slick feature nonetheless. I love Emirates’ new first-class suite on the 777-300ER, but if you’re traveling with a companion, you’ll need to part ways at the door — there are no adjoining suites, and there isn’t anywhere to sit if you’re looking to share a meal during the flight. Singapore’s new suite, on the other hand, offers an entirely different experience. If you book suites in rows 1 and 2, on the same side of the plane, you can lower a partition and combine your two suites into one gigantic space. It’s unreal how large this thing is — I’ve seen it described as “larger than a city apartment,” which is a stretch, of course, but it’s definitely the most sizable private room I’ve seen on a commercial airliner. The double bed is the star feature, of course — the bedding is still separate, as you might find in some European hotels with two twins pushed together to form a king, but you can sleep side-by-side with your companion, which I’ve only otherwise experienced on Etihad. Singapore’s version blows Etihad out of the water, though — it’s pretty incredible. 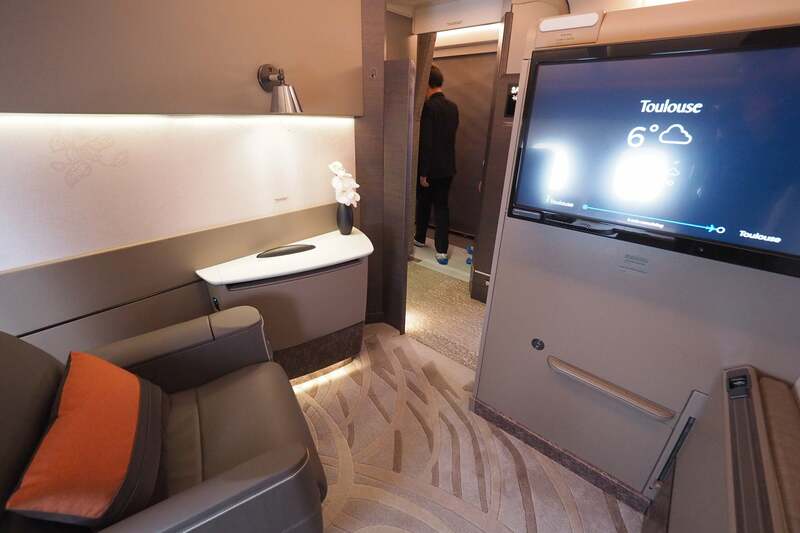 This is actually an area where Emirates has Singapore beat — the former offers entirely self-contained mini-apartments, while SQ’s walls and doors stop around eye level. Still, with the door shut, you’d need to make quite an effort to see over the wall, and while you’ll probably want to behave yourself while napping in that double bed, you should be able to make it through the entire flight without seeing another passenger — assuming you don’t leave your suite. 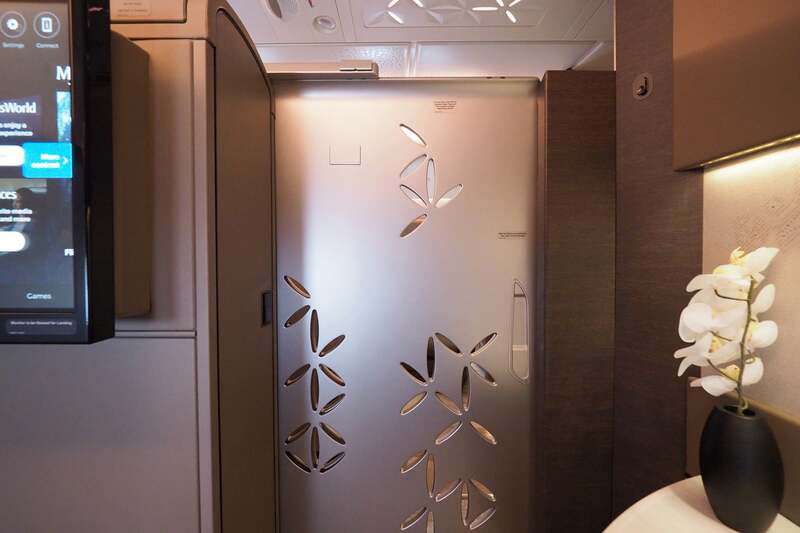 Etihad’s A380 Residence is the only product that offers more privacy than this suite while still featuring a dedicated bed. Each suite offers a 32-inch touchscreen TV, in addition to a separate tablet that you can use to select content and control various cabin features, including all of the lighting. Unique to Singapore, KrisFlyer members can actually save their preferences, too, setting various scene modes that they can easily access every time they fly in one of the new suites. So if you find that you like the lights at a certain brightness during mealtime, you can save that configuration as a preset and pull it up on future flights just by entering your KrisFlyer number. The same goes for content — you can pre-select movies and TV shows before you fly, and if you’re connecting from one flight to the next you can pick up a film right where you left off on the previous leg. This is also the first Singapore Airlines plane to sport Ka-band Global Xpress Wi-Fi. In theory, this new tech should offer an experience comparable to what you’d find on the ground, with support for streaming HD video and more, but unfortunately connectivity was a bit hit or miss during the delivery flight, and you won’t be able to get online at all while flying over certain countries — we were completely offline as we passed over India, for example, which represented a good chunk of the flight. Still, when it worked, I had no problem sharing pictures and short videos, loading emails and more. 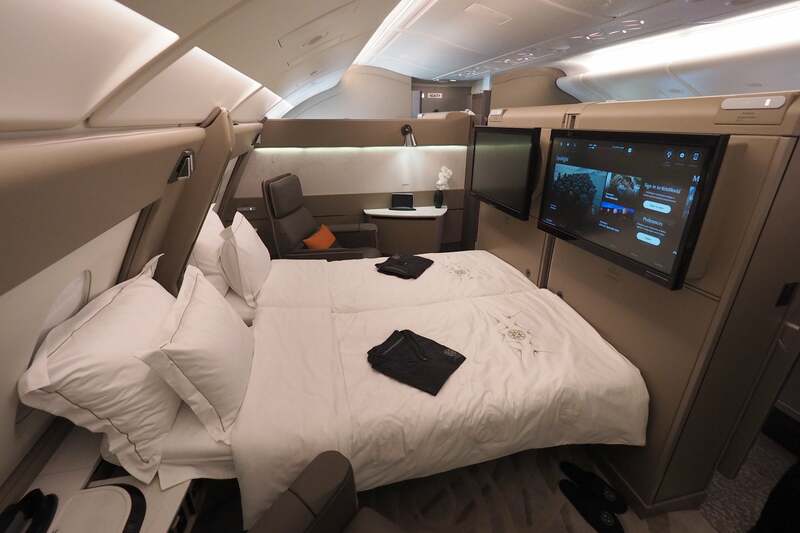 If you’re hoping to redeem miles, there’s really no getting around it — with just six suites on each plane, compared to 12 on the older A380, finding saver award availability is going to be a long shot. That said, if you do manage to score one of these suites, you’ll really be in for a treat. Even when the cabin’s full, you can expect exceptional service, since flight attendants will be able to spend much more time focused on each passenger. And with two lavatories for the first-class cabin, it’s unlikely you’ll ever have to wait to use the bathroom. News of the next destination should come early next year — we’re expecting a daily flight to London (LHR), or perhaps another destination in Europe. There’s no word yet on when the new product will make its way to the airline’s fifth-freedom flight between New York (JFK) and Frankfurt (FRA), though the airline has confirmed that it’ll eventually be available on that route as well. Singapore’s former A380 suite remains an excellent choice, and that’s what you’ll get assuming you aren’t on flight 221 or 232 between Singapore and Sydney. If the latest and greatest is what you’re after, though, you’ll unfortunately have to wait.